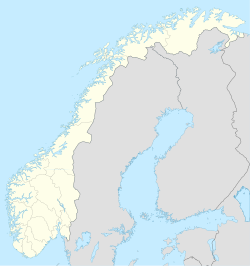 Nordfjordeid is the administrative centre of the municipality of Eid in Sogn og Fjordane county, western Norway. It is located at the end of the Eidsfjorden, an arm off of the main Nordfjorden, west of the large lake Hornindalsvatnet. The village of Stårheim is located about 12 kilometres (7.5 mi) to the west, the village of Mogrenda is about 5 kilometres (3.1 mi) to the east, and the village of Lote is about 7 kilometres (4.3 mi) to the southeast. The village is a commercial hub for the municipality and it includes several industries, shopping, and schools. Eid Church is also located in the village and it is the main church for the municipality. The European route E39 highway passes by Nordfjordeid on its way from Bergen to Ålesund. Norwegian National Road 15 passes through the village on its way from Måløy to Otta. Nordfjordeid is located approximately 9 hours from the national capital of Oslo, 5 hours from the city of Bergen, and 3 hours from the city of Ålesund by car. The 2.33-square-kilometre (580-acre) village has a population (2013) of 2,740; giving the village a population density of 1,176 inhabitants per square kilometre (3,050/sq mi). There are many tourist attractions in this area, such as Geirangerfjord and the famous glacier at Briksdalen which attracts numerous international tourists every year. There is also the well known Harpefossen Ski Resort and a thriving professional opera company. Nordfjordeid is the location of the Sophus Lie Conference Center for mathematics. Notable mathematician Sophus Lie was born in the town in 1842. There are many possibilities of fine hiking in the mountains, either north or south, surrounding the village, a hiking trail starting near the Lote Tunnel going south leads to a magnificent 900-metre (3,000 ft) high view over other arms of the Nordfjorden and splendid area. Nordfjordeid is also the host for Malakoff Rockfestival, where artists such as The School, Bertine Zetlitz, Marit Larsen, Lukestar, Jim Stärk, Animal Alpha, Åge Aleksandersen, Eye Emma Jedi, Svelekameratane, and Turbonegro have performed. ^ a b c Statistisk sentralbyrå (1 January 2013). "Urban settlements. Population and area, by municipality". ^ "Nordfjordeid" (in Norwegian). yr.no. Retrieved 2013-09-24. ^ "Sophus Lie Conference Center". Retrieved 26 September 2013. ^ "Sophus Lie". Encyclopædia Britannica. This page was last edited on 21 August 2018, at 16:30 (UTC).